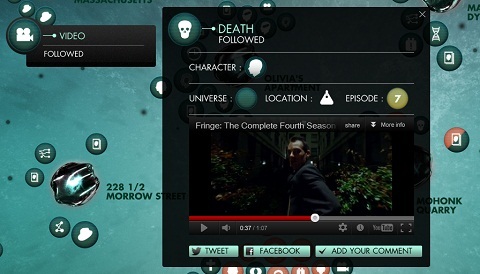 Dynamic data-visualisation of all the facts, figures and phenomena at the heart of Fringe S4. 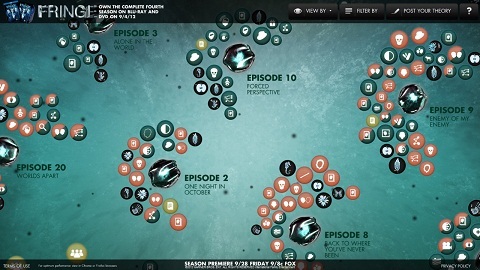 Universes of Fringe: a massively dynamic data visualisation, featuring all the facts, figures and phenomena behind season 4. TV shows spanning dozes of episodes and multiple seasons give us new opportunities to realise and mobilise community around entertainment properties. When Warner Home Entertainment invited us to submit ideas to promote Fringe: The Complete Fourth Season on Blu-ray and DVD, we knew we’d be dealing with a devoted and persistent fan-base, one that we’d need to very actively engage. 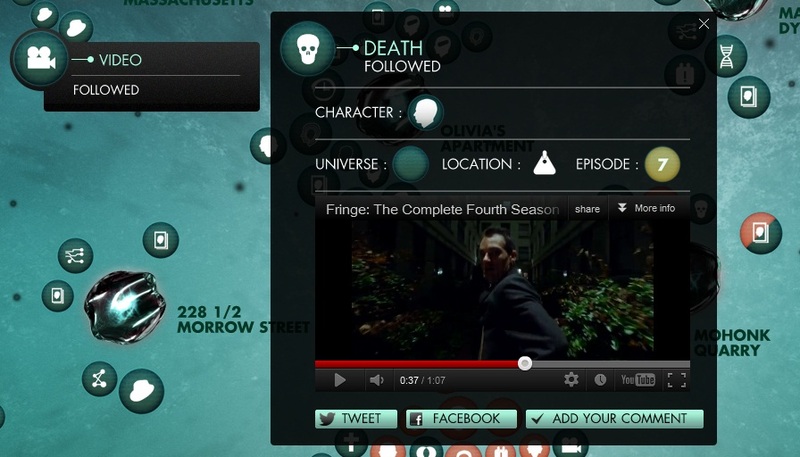 The result, Universes of Fringe, is a dynamic visualisation of all the facts, figures and phenomena at the heart of Fringe S4. 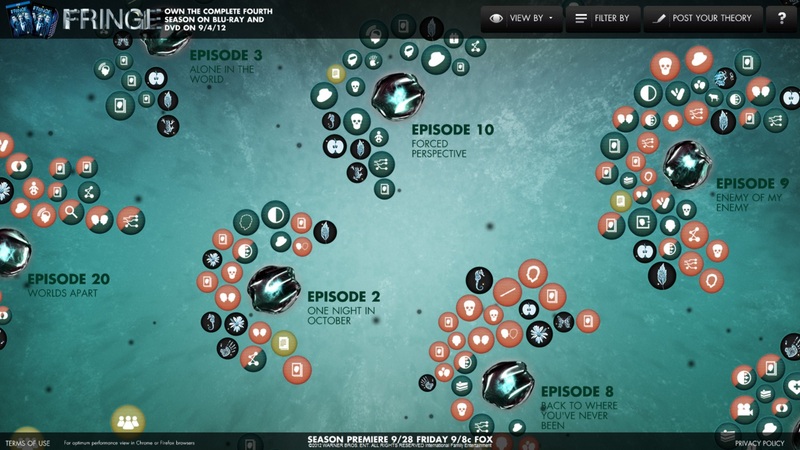 Built in HTML5 to be accessible on both web browsers and mobile devices, this ‘by-the-numbers’ breakdown of the 22 episodes covers everything from the intertwining timelines of the ‘Blueverse’ and the ‘Redverse’ to the frequency and format of Walter’s food cravings. Moreover, the guide invites anyone to post their own facts and theories, with the intention of making it a truly collaborative affair, supported by an outreach programme on Deviant Art and Tumblr. This got the site in front of some of Fringe’s biggest fans, as a result of which it now plays host to some spectacular fan art. As always, we’d like to thank the people behind the awesomeness: Georgi, Emma, Tom, Juan, Chris, Fraser, Simon and Cat; and particular thanks to Lauren and Elisa at Warner Bros for backing the concept at their end!